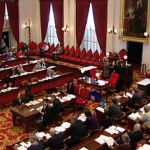 On March 14, 2008, the Vermont House joined the Senate in approving legislation that would implement instant runoff voting (IRV) for congressional elections beginning in 2008. The measure passed by a vote of 81 to 60. If this bill is implemented, Vermont will be the first state to adopt IRV for statewide elections. This legislation generated strong support from U.S. Senator Bernie Sanders, U.S. Rep. Peter Welch, Common Cause, Vermont PIRG, FairVote and the League of Women Voters of Vermont. IRV has a strong history of support in Vermont including endorsements from more than 50 town meetings and former governor Howard Dean. IRV is currently used in Burlington, VT.